Creating a home is a journey that necessitates a collaborative process. As with anything worthwhile, outcome is directly proportionate to effort and intention. It is a team effort that requires responsibility, participation and accountability by everyone. As your architects we lead, communicate, facilitate and coordinate that team. At Trillium we work with you to make the outcome worthwhile, rewarding and cherished. After all, a cherished home will be a well cared for home and it will live long into the future. We want to make your house into the most desirable home in your neighborhood. Follow these links to learn more. Initial Meeting: First we meet and present ourselves - and our work - to you. We listen to you tell us what you are looking to accomplish. This first meeting is free and it is a time to get to know each other and for each of us to decide if we are a fit for the project. We get to know you: Once we decide to work together and have agreed on the project scope and fee we meet again. We ask you a lot of questions about the way you live and listen to the answers. We gather information about you your family, your community and your connection to the world at large. We will need to spend time getting familiar with your lifestyle and surroundings. You are an extremely important and integral part of this process. The input we get from you is vital to understanding your needs and desires. If we are renovating or adding onto an existing house, we will take pictures and measurements and gather relevant data we may need. It is very helpful at this point to see any drawings, surveys or paper work you may have regarding the construction of your existing home. 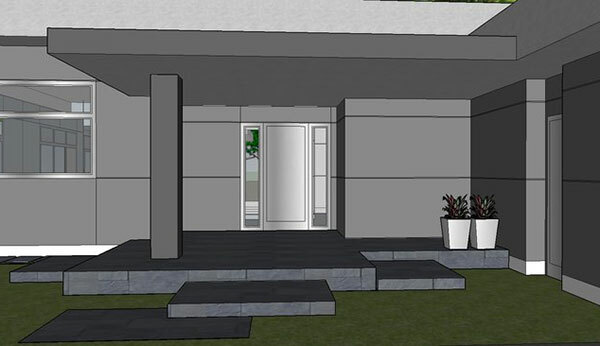 The Design Phase is complete when we have come up with a scheme (i.e. basic plans and elevations—what your house will look like) that you feel work for you and solve your house problems. Creating working drawings: Once a scheme is chosen and all parties are pleased with the general design, we begin to produce Construction Documents. The complete set of documents will be a detailed instruction manual which will cover every aspect of your project. This is the most time consuming and valuable portion of the architects work. During this time we will engage in a continuous process of asking questions, researching answers, nudging walls this way and that, working out details and proportions, and finding solutions until the documents are complete. As part of this process we will produce plans suitable for bidding and town approval as well as a full set of construction documents along with specifications. Choosing a builder: There are several choices for building your home. We will guide you in finding and choosing a builder. We will help you understand bids, schedules and building methodologies. We will raise red flags when something has been left out or a question is left unanswered. One option is to hire a builder in the beginning of the process- someone who you trust or who has a good reputation. The builder will provide cost estimates early in the process. Some clients feel that they could easily be cheated this way, however, our experience is that this is often a great way to work. The builder becomes integral to the process providing valuable input on building methods, value engineering and is invested in a good outcome. For houses that are going to meet high standards of health and energy efficiency, we recommend hiring a good contractor, early. We work with contractors that we know and trust as honest, highly knowledgeable and thoughtful people. These are contractors that also have 'Intentional Companies'. If you hire one of these contractors early in the process we will personally guarantee you a job very well done at a very reasonably price. A job will always go better when the team is on board from the beginning and all of the team players speak the same language and communicate openly. Another option is to complete the construction documents and then have several builders bid on these documents. Some clients feel more comfortable with picking a builder at this point in the project. We have many builder who we would be happy to bring to the bidding table. We encourage you to bring people that you may know of as well but we require that they have references that you know or can be well vetted before hand. We have seen many jobs end very badly because a shady contractor was chosen and his references were not well checked. The team needs to be honest and work well together for a smooth and cost effective project to come to fruition. During Construction: The Architect traditionally monitors construction as the Owners representative. Our presence helps the contractor understand that someone who knows what is going on is watching the site. Construction can be hectic. We will be your eyes ears and mouth on the job site. We will help you make decisions and deal with any unforeseen problems that may arise. Also - in this fast paced world, it is very unlikely that all specification will be defined at the start of construction. This means that things like lighting and plumbing fixtures are not yet chosen, tile and trim have not been finalized, exact millwork drawings are still being revised, paint and finishes are not yet chosen,etc etc. It's not easy to lop off the construction administration portion of the architects fee these days because so much is not yet decided. We will help you chose colors, details, and furniture to complete your home. We will be there for you until you are living happily in your new surroundings. Construction Administration generally means weekly site meeting with the contractor and owner and any other subs currently active present. We are obsessive about communication. A team that communicates well ensures a great outcome. Weekly meeting keep everyone in the loop and usually get a lot of questions answered quickly for the contractor.